Looks like the top 6 is pretty much decided. Teams aren't that well balanced this year with PWI, DD, KXIP sucking already. MI is has been very consistent and should make the top 4. RCB has Gayle who fires more often that not, should make it also. Two spots left between CSK, KKR, RR and SRH. SRH should be bowing out due to their pathetic batting. So most likely it will come down to CSK, KKR and RR for 2 spots. Cooper now has the purple cap. take a picture and frame it while you can.. aint gonna last for long. THe KKR team is best as compared to other team. 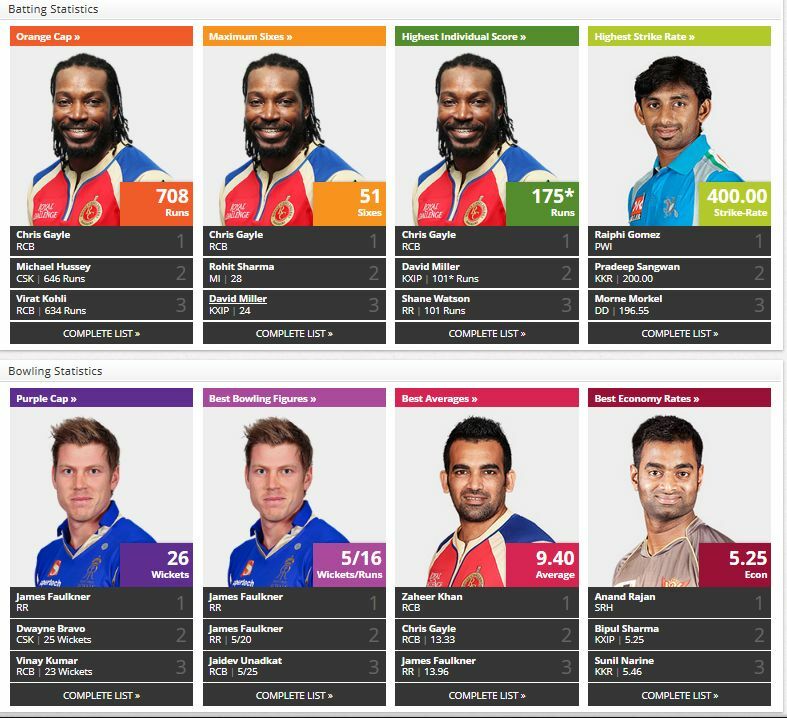 But aren't both of them from official IPL site? 95* highest individual score now. Viru. Vk And Vk ... Lovely To See Indians Dominating The Lists ... I Would Love It If All Of The Top 5 Can Be Indians. Now that one inevitable thing has happened (CSK topping the table), it is time for the other inevitable event (Hyderabad pickles' slide down the table). to happen as well. It is a joke for CSK and Hyderabad to be equal on points. One is the league, the other is inter-city division 2. Now that one inevitable thing has happened (CSK topping the table)' date=' it is time for the other inevitable event (Hyderabad pickles' slide down the table). to happen as well. It is a joke for CSK and Hyderabad to be equal on points. One is the league, the other is inter-city division 2. [/quote'] Coalition :fail: :hysterical::hysterical: Not surprising at all - When CSK was in the dumps early one, they clutched at SRH coat tails and got their support.Not that they have topped the table, SRH ko laath . Thats why I would never trust the CSK fraternity.Remember how they kicked Lil' Zee out last year when he was getting too big for his boots ? it's interesting that for best economy rate none of the usual subjects are there. Will update at end of today's matchc. southie teams are leading the table.